Like XCOM, But In The Wild West? You Have My Attention. 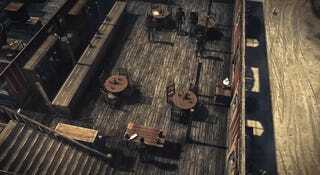 "In a nutshell, Hard West is a turn-based squad tactical with adventurous world exploration. Think X-Com combat with Heroes of Might and Magic world map". Well hello there perfect game description. Hard West, currently on Kickstarter, is looking very much like its sales pitch: you explore a Wild West overworld then, when it's time to get down to business, you switch to a turn-based tactical mode. Where, yes, you can flip saloon tables, make fancy trick shots off the environment and empty six-shooters into swarthy villains. If you're thinking this looks awfully polished for a Kickstarter game, the studio behind it is made up of a bunch of developers who have worked on series like Call of Juarez and Dead Island. Hard West is looking for $70,000. You can back it (or check out more info) here.